Litter. I’m neither enjoying, nor lovin’ it. 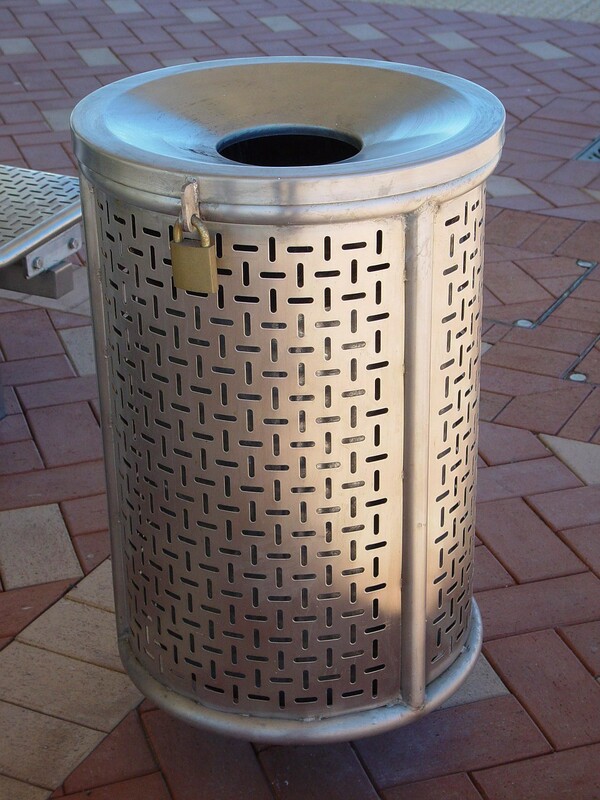 Stop putting rubbish bins in all the wrong places! Litter really annoys me. It’s not just that it is environmentally damaging and a horrible eyesore. It’s not because it also highlights the presence of socially irresponsible people in my community. It annoys me because I’m constantly having to pick up other people’s litter from my lawn. 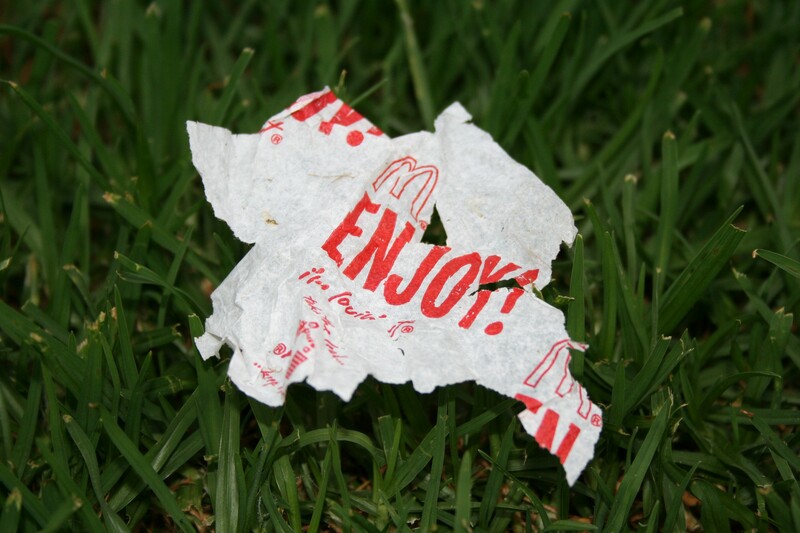 McDonald’s packaging, drink bottles, ice block sticks, and pie wrappers are the most prevalent. I began stockpiling the items I picked up to see how much litter was finding its way onto my lawn over the course of a month. I gave up after filling a 10 litre bucket full in just over a week. What I discovered though, is that a pattern was beginning to form. First, let me explain where my house is situated. I live in a residential area of the city on one of the popular routes between the outer suburbs and the nearby town centre. My property is about 300 metres up the road from the town centre. It has a bunch of retail shops, food outlets, and the local high school. Further up the road about 2 blocks beyond my place towards the suburbs is a local dairy and takeaway shop. 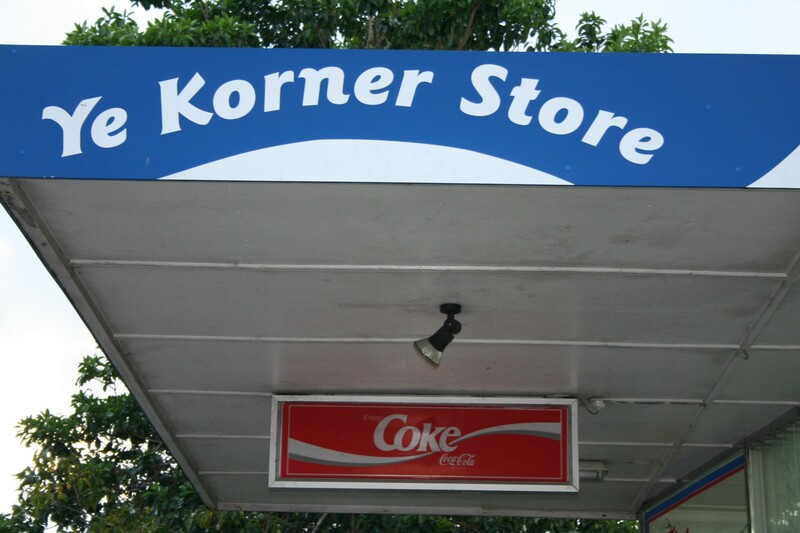 The source of many an ice block wrapper — Ye Korner Store. In the mornings before school, students would walk past my place on their way to class. In the afternoon, they would wander back home again in groups of two or three at a time. It was relatively common to see students munching on a pie or sipping a drink on their way to school. On their return trip, brown paper bags from McDonald’s seemed to be their items of choice. It wasn’t until I started building my little stockpile that I began to take notice of what passers-by carried with them. And then I realised. I lived a ice block eating distance from the dairy, and a Big Mac Combo eating distance from McDonald’s! I decided to test my hypothesis by popping up to the shop and buying a pie. The temperature was perfect. Not too hot, not too cold. I set off back down the road munching on my pie, and by the time I got to my last mouth full … well, well, well. Right outside my house. During my experimental pie trip I observed another phenomenon. There was a rubbish bin right outside the dairy, but there was nowhere to sit and eat. Why would anyone buy takeaway food and stand outside the shop to eat it? Does there really need to be a bin there? I found myself deeply fascinated by the weird and wonderful places bins had been placed in my town relative to seats and food outlets! I fired up my GIS software QGIS and loaded up a basemap showing the streets for my local area. Next, I needed the locations of all the nearby food outlets. For this I used the points of interest from Zenbu which can be downloaded from the Koordinates website. I also needed the locations of rubbish bins and public seating areas to be able to test my theory. That information hasn’t been published anywhere that I can find, so it was time to start digitising. For this I cruised the streets using Google Street View and as I saw bins and seats, I digitised them in QGIS from the high resolution aerial photos I downloaded from LINZ data service. For visualisation purposes, I exported the layers from QGIS as kml files so I could open them in Google MyMaps. What I discovered is that there are a hell of a lot or rubbish bins along the main shopping strip, and sod all anywhere else. Often the bins were sited right next to public seating, which makes sense. A few public seating areas had no bins, and in other places there was a bin every 15 metres! You can have a browse at the resulting map here. Eateries, bins, seats, and bus stops. I noticed something else during the data capture process. It seemed that the bus stops that had seats also had rubbish bins, but those that didn’t have seats didn’t have bins either. I could check this by downloading the bus stop locations from the Northland Regional Council’s open data service. Well, I thought I could, but that data set is not shared on that platform. You can get slightly dated Whangarei bus stop information on Koordinates. Throwing bus stop locations into the mix, my suspicions were confirmed. There is pretty much no pattern or obvious logic behind rubbish bin locations. So the next question is, where should the rubbish bins be placed? The next thing to work out is how far people walk before finishing that Big Mac Combo. From my urban planning background, I know that 400m is the distance that people will generally walk to a shop or bus stop. That might provide a useful guide for an upper limit of the people will walk while eating. Google tells me that the average walking speed is 5km/hr, but I’m guessing that most people won’t be walking at full pace if they are trying to get food in their mouth. Average human walking speed is 5km/hr according to Wikipedia. Adjusting for a slower walking speed (say 3km/hr) it would take 8 minutes to walk 400m. Seems a reasonable time to eat a burger while on the move. It would be a bit quicker to down an ice block or bottle of soft drink. In the 5 minutes it took you to consume these, you would have travelled 250 metres. Time to start plotting those travel distances. There are a few different types of food outlets. Some offer dining facilities, such as eat-in restaurants, taverns and cafes. Others mainly supply take home meals such as burgers, fish & chips, or sushi. Some places supply food and beverages that you can’t consume on the move, like bulk food wholesalers, butchers, and liquor outlets. The remaining category are the ones that offer snack foods like fizzy drinks, ice blocks, and pies. 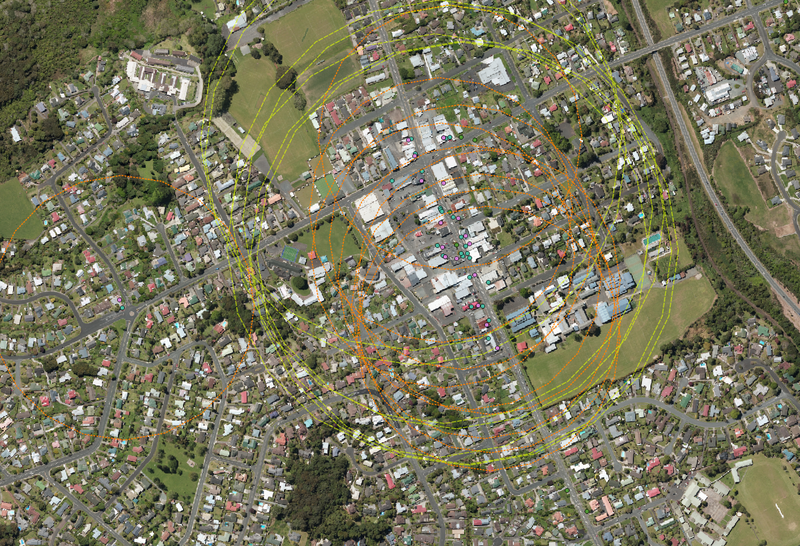 For the purposes of my exercise I grouped the food outlets into the following categories and then mapped a radius distance of 250 metres for snack outlets, and 400 metres for takeaway meals. I left out the outlets that don’t offer eat while walking food options. The results were very revealing, and just as I suspected, my house is right on the storm front where all those lines bunch up and overlap! The dashed lines mark the last mouth-fulls of food. I zipped all the shape files I had created and loaded them into CartoDB. The existing rubbish bins I displayed as a heat map to illustrate how ridiculously close together they are in the main street. The walking distances were shown as semi-transparent polygons to be able to visualise the overlaps relative to the streets. It was very easy to see where the last mouth fulls of food were being consumed, so time to start thinking about where bins should be located. There are lots of dog owners around this area (I am one of them) and the street network provides for a variety of walking loops. As you can tell from the large distances between rubbish bins, responsible dog owners end up having to carry bags of poop for quite a distance. The most convenient locations for bins for dog owners are at intersections, which is where the various walking loops overlap. The final task was to locate intersections along the main walking routes that were at the point where people were looking for somewhere to put that pie wrapper or empty bottle. I created a new layer in CartoDB, marked each of these points, and voila! You can view my recommended locations for rubbish bins here by clicking on the following map link. Yes, I’m talking to you Whangarei District Council!